Whoa boy, it's been a busy summer! Almost every weekend this summer I've enjoyed some outdoor activity with my wife. Many of these excursions were biking on rail trails, so I guess that qualifies as rail-related activities. My travel schedule for work has picked up as well, leaving me less time for the railroad as I have been away from the basement. However, some things have gotten done. The upgrade of the electrical system is almost complete. Although there are a couple of more cab bus access points to put in. LED strip layout lighting has been added to the small section of the exposed lower deck; and that includes dimming circuits and night lighting effects. On Sept. 5 I held my second open house of the year. It was unusual inasmuch as that Saturday was during the Labor Day weekend. Looking at my schedule going forward, including business travel, there was no other open day until November, which would have been too late in the year. Attendance was slightly down because of the date, but I think that everyone had a good time. On Tuesday Sept. 8, I drove out to Indianapolis to attend the O Scale National (beginning Friday Sept. 11). I was able to combine business with pleasure as Indianapolis is where my business travel takes me. I gave 2 clinics on Friday at the convention and 2 on Saturday. 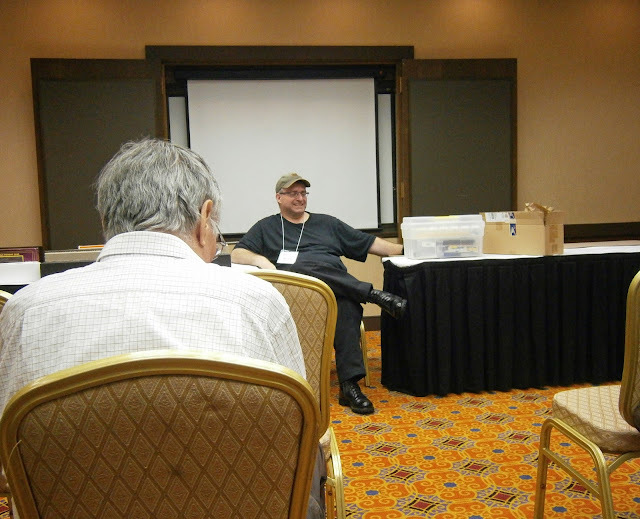 3D Printing for Model Railroaders and Fun With LEDs were the topics. "Fun With LEDs" - expand to full screen, scroll up and down to see all of the slides. Use the live links to see additional material. Here's a video of the first run of my clinic "3D Printing for Model Railroaders". Expand it to full screen to be able to read the slides. Jim Lincoln was in attendance as well and Jim hosted the P48 meeting on Friday night. Jim attended and contributed to my first 3D Printing clinic - Thanks Jim! On Oct. 22, I gave the LED clinic at the NMRA Mideast Region convention in NJ. My clinic on Thursday night was the lead-off event and I had huge attendance - so much so that I did not have enough hand-out CDs to go around. My layout project for the winter is to get some more switch machines installed; add LED strip-based layout lighting; get more equipment onto the layout (now that dropping a train over the end of track and onto the floor is much less of a possibility) and make sure that the equipment on the layout tracks well, has proper coupler height, etc. Oh yes, and if I have time, I need to put up photo backdrops. I've reached what the military calls Initial Operating Capability (IOC) with JMRI up and running, but not yet fully deployed. And, if all of this is not enough, I'm slowly building my 3D printer kit in my "spare" time. It's going to be an interesting winter! I just read about your clinic titled "Fun with LEDs" in the NMRA magazine. Coincidentally, I just presented a clinic using the same title at the NMRA PSR convention in Culver City, California (near Los Angeles). I promise you, I did not know about your clinic beforehand, but after reading of it in the NMRA, I went looking and found your PowerPoint. Great job! As it turns out, the outline of my clinic was much the same as yours, but I spent a lot of my presentation showing examples of how I have used LEDs on my n-scale layout. In my scale, I concentrated more on the smallest SMD LEDs. I plan to present the same clinic at the regional convention in Ontario, California next fall. Nevertheless, I plan to include a link to your PP file in my handouts, and would like to have your permission to also print a couple pages from your .pdf file for my presentation. I will be sure to give you full credit for anything I use. You may contact me at gbohot@verizon.net or phone to 909-902-5936.
very nice blog, all the information is provided nicely and really a good site to read.